Tanner is a beautiful super mega coated Liver Tan schnauzer. He has TONS of hair! Tanner is such a sweet boy. He loves attention and loves to cuddle! Tanner should produce Liver Tan and Liver Parti pups. I am sure that he will have absolutely beautiful puppies! Oh my! Merlin is just stunning! 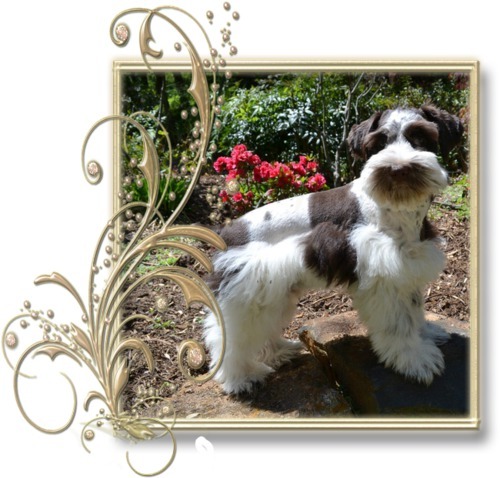 He is a beautiful Chocolate Parti Merle schnauzer with a thick mega coat. Merlin has partial blue eyes, a wonderful trait in the Merle schnauzers. His chocolate(liver) color is SO dark and is non-fading. 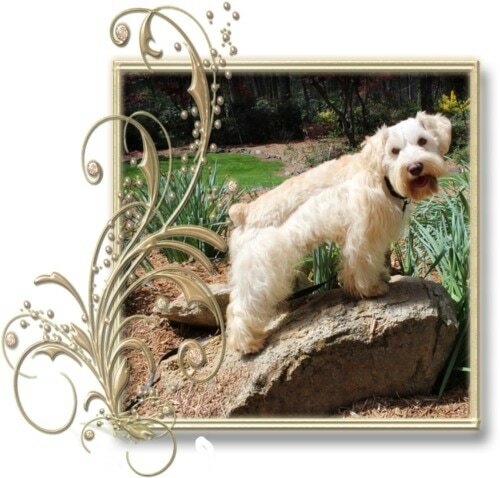 He is registered with the Merle Schnauzer Club of America and is from impressive AKC lines. You can tell that he is from exquisite breeding just from taking a look at him. He is super sweet-our "Teddy Bear!" Merlin loves to give hugs and kisses and he loves everyone he meets! Rolo is a beautiful mega coated Liver Parti Schnauzer. He is a Porsche & Merlin pup. We just love him. He is beautiful, has a wonderful mega coat and is such a sweet boy. He is a super sweet boy that loves to cuddle! We are looking forward to his puppies. Penut is a beautiful super mega coated Liver schnauzer. He has TONS of hair! Peanut is such a sweet boy. He loves attention and loves to cuddle! Peanut should produce Liver and Liver Parti pups. I am sure that he will have absolutely beautiful puppies! Biscuit is a beautiful mega coated Wheaton Schnauzer. Wheaton Schnauzers can be Cream, Peach, or an Apricot looking color. All Wheaton's have Brown noses and usually cone from Liver (chocolate lines). Both of Biscuits parents are Live schnauzers. Biscuit is beautiful, has a wonderful mega coat and is a super sweet boy. He loves to cuddle! We are looking forward to his puppies.